According to Goodreads, I've been reading Hard Times since 9th January, so thank goodness it's over and I've read it! Yikes. What a struggle it was to get through. If I didn't have to read it for a university course, I would've given up long ago. I even had to switch from print to audio book just to make it easier on myself! 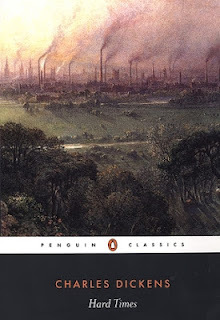 This is the first full-length Dickens novel that I've read, and it's undoubtedly put me off reading any of his others. The description says that this is the shortest of them all, so imagine how long Great Expectations, Oliver Twist or Little Dorrit might take me! I don't think I'll be trying them out any time soon. Hard Times had a number of points I struggled to feel enthusiastic about, but there were a few that I enjoyed about it. The characters are very diverse and of course well written; the villains are properly so, and the endearing characters grow more intriguing. There are also many twists which aren't expected, and the conclusion I found somewhat heartwarming. But, in the end, Hard Times proved too monotonous for me. I'll stick to reading Dickens' short stories and articles, which I seem to enjoy much more.